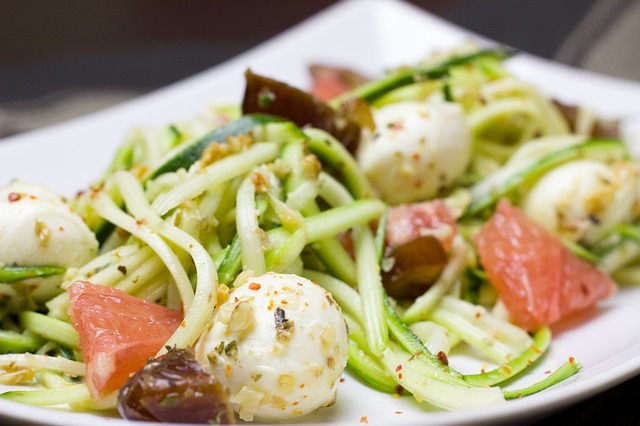 Wondering what ‘ZOODLES’ are?? 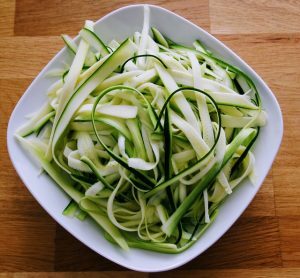 Zoodles= Zucchini noodles, or in other words noodles made by spiralizing zucchini (using a vegetable spiralizer). The resulting zoodles is a great low-carb substitute for any recipe that calls for noodles, pasta/spaghetti (or even rice)! You can even make zucchini sheets and use them instead of lasagna sheets. 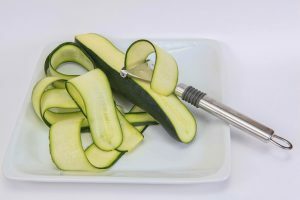 If you don’t have a vegetable spiralizer then use your vegetable peeler to make sheets, then cut the sheets into strips. This is an easy no-cook recipe. Zoodles are now available in the salad section of the grocery store and you could pick up one if you are running late and don’t know what to cook for dinner. Avocados are great for making sauces because they are naturally thick and creamy. They are loaded with healthy fat (monounsaturated) and research has shown that people who eat avocados have higher levels of beneficial HDL cholesterol than those who do not. Other essential nutrients include fiber, vitamins, folic acid, vitamin E and potassium. Add some protein in the form of cheese (or paneer) and you have a wholesome and filling meal. To make the sauce, place all of the sauce ingredients in a blender and blend until smooth. Taste and add additional salt and pepper if desired. Toss the zoodles, bocconcini, grape tomatoes in the sauce. Taste and add additional salt and pepper if desired. You can also try adding some chili flakes if you want something spicier. 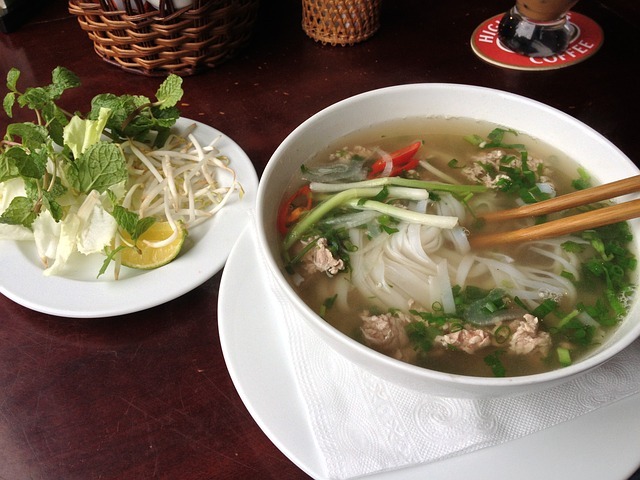 Have you tried PHO (prounched as “FUH”)?? Zoodles are a low-carb substitute for noodles/pasta if you are on a low-carb diet, low-calorie diet or just want to increase your vegetable intake. Zucchini is a member of the gourd family and is low in calorie, high in fibre, also rich in flavonoid antioxidants (mostly found in the skin), B-complex vitamins, folate, B6, B1, B2, B3, and choline, as well as minerals like potassium, zinc and magnesium. This is great dish when you are feeling a little under the weather or need something warm or on a cold winter’s day or when you are feeling lazy to make an elaborate meal. It’s a one pot dish which will keep you full for a long time. Heat 1-2 teaspoon of oil in a large pot, add the star anise, peppercorns, cloves and ginger strips. After a minute, add the sliced onions and saute till they are translucent. (this is an optional step as I find sauteing the onions and ginger adds a better flavour to the pho rather than boiling it all in the stock). Add the stock, the chicken, fish sauce, salt, black pepper and to the stock and bring it to a boil. Then lower the heat and let it simmer for 20-25 mins. (if you don’t want to saute the onions and ginger, then you need to add it directly to the stock along with the whole spices). Divide the zucchini noodles into 4 bowls. Ladle the piping hot soup into bowls and top with spring onion, bean/moong sprouts, basil, cilantro. Serve with a lime wedge to squeeze over, and hot sauce, extra fish sauce and sliced chilli to add to taste.